Early stage images of xanthan on mica in aqueous buffer. (a) Method 1, drop-deposited, imaged in buffer 1. (b) Method 2, in-situ adsorbed from and imaged in buffer 2. Bottom panels: Line profiles depict the heights of the features beneath the white lines in the images. 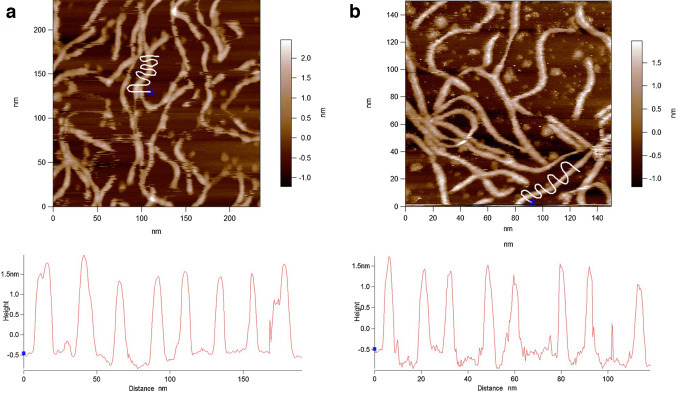 Direct visual evidence obtained by atomic force microscopy demonstrates that when xanthan is adsorbed from aqueous solution onto the heterogeneously charged substrate mica, its helical conformation is distorted. Following adsorption it requires annealing for several hours to restore its ordered helical state. Once the helix state reforms, the AFM images obtained showed clear resolution of the periodicity with a value of 4.7 nm consistent with the previously predicted models. In addition, the images also reveal evidence that the helix is formed by a double strand, a clarification of an ambiguity of the xanthan ultrastructure that has been outstanding for many years.